Welcome back for Part 2 of the post with the longest title ever! I’ve never planned a trip by myself before. I’ve never surprised anyone with such a big gift, either. As the time to reveal my plans got closer, I started to worry a little that the Mister wouldn’t like it or that when we actually got there, the trip wouldn’t live up to the hype I’d created. Also, what if I’d planned too many activities for each day and we wound up rushing from one to the next without fully enjoying each one? I’m happy to say all these worries were unfounded; somehow I’d allowed the right amount of time for each event and we even had time to wander for a while with no destination. I just couldn’t stop worrying for a couple of days there. About a week before the big day, I cooked a special birthday dinner and gave the Mister the gift I had worked for months to prepare: a suitcase packed with the itinerary scrapbook and other items related to our trip. I have to say, that’s one good-lookin’ salad! 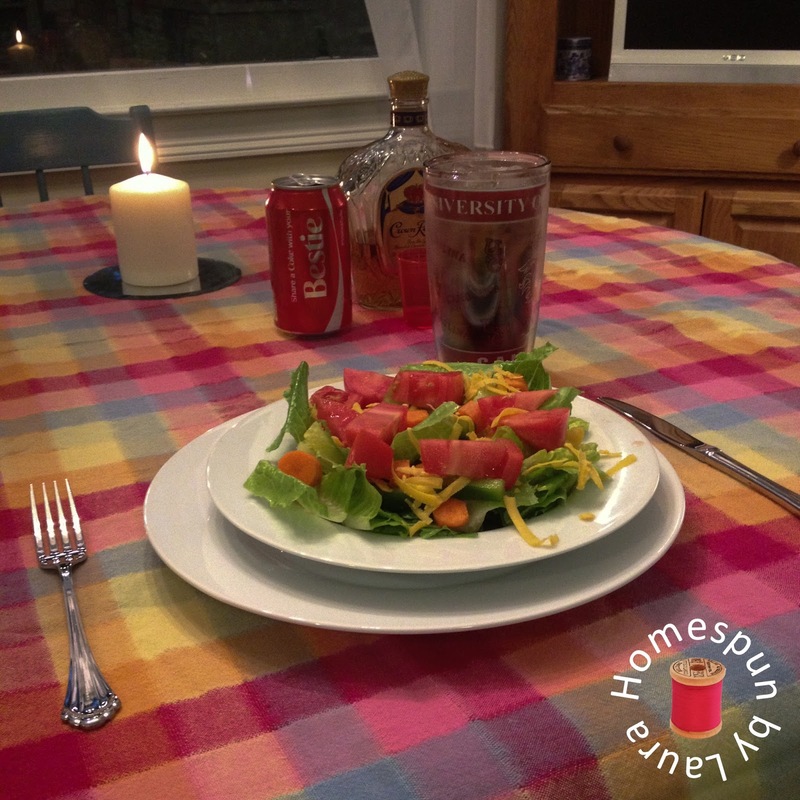 I’m pleased to say he was completely surprised when he got home to find a candlelit table, which was actually covered with a tablecloth, and one of our new favorite meals minutes from being ready to enjoy. He was further surprised when I rolled the suitcase full of goodies over. 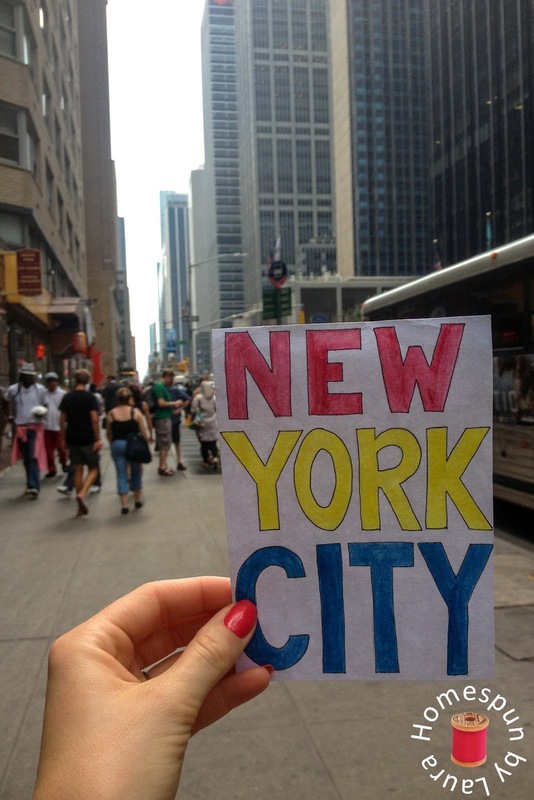 Fast forward nine days, and we were on our way to the Big Apple! We were a bit delayed in leaving for the airport since the Mister had to wrap up a few last minute work items. Then we encountered road construction and, on top of that, the engine overheated and we had to pull over for about 20 minutes to let it cool. I called the airline, and the representative tried to charge me an extra $375 (I’m still not sure if this was per ticket or total) to switch to the next flight, which left 2 hours later. My shocked and distressed reply led her to ‘check on some options’ – and when she came back, she said she could switch us for free. How nice. What I didn’t know until the following week was that that date was becoming known as Flypocolypse because of the air traffic control system that was down near DC. Our original flight had actually been delayed, so we could probably have made it, but of course we didn’t know that until we arrived at the gate. On our new flight, we had to fly around DC, which added some time to our flight and put us on the ground at Newark even later than expected (and then there was another delay on the train on the way into the city!). But since a lot of people in other places got stranded and didn’t make it to their destinations, I’m grateful to have only lost a few hours. And we still managed to do all but one of the items on the day’s itinerary without feeling rushed! 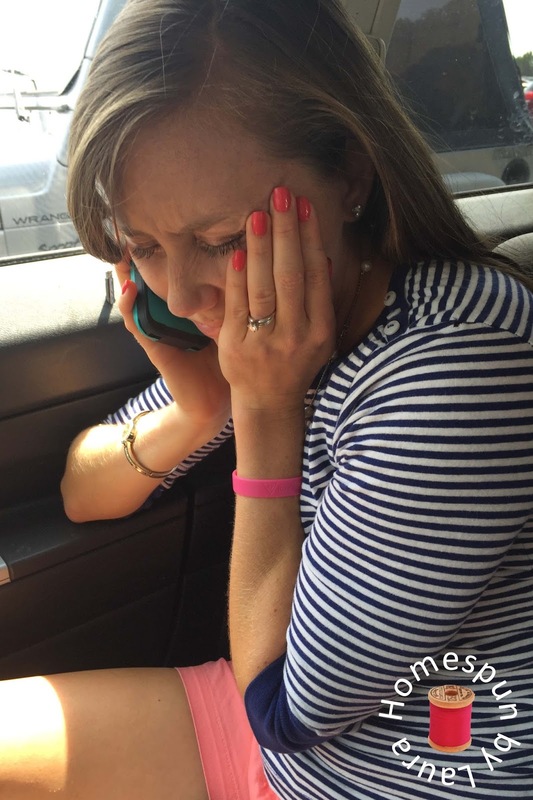 After parking at the airport, I reenacted the phone call. 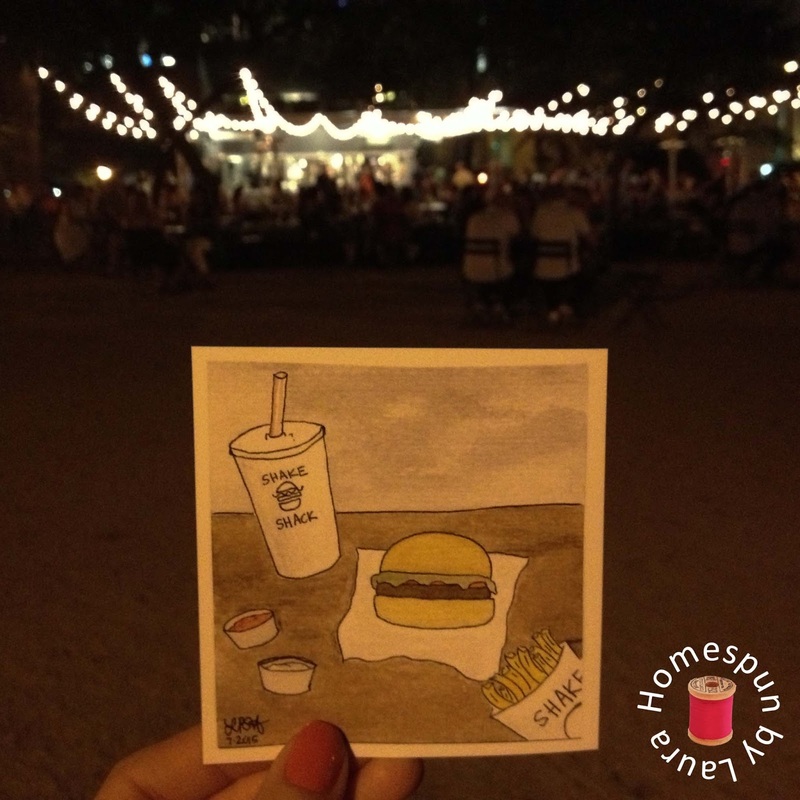 By the time we got checked into our hotel and changed into fresh clothes, it was around 7:00, so we headed straight to dinner at the Shake Shack. It was delicious. I consider myself a bit of a burger connoisseur, since it’s one of about 4 things on the list of things that I’ll eat at a restaurant – the others being pizza, pasta, and steak – and my Shack Burger was definitely in my Top 5 Favorite Burgers of All Time! Part of that was certainly a result of the ambiance, but the burger was actually really tasty, too. And everyone in New York seems to agree; I’d estimate that at one point there were over 50 people waiting in line to order (fortunately, we already had our food at that point). 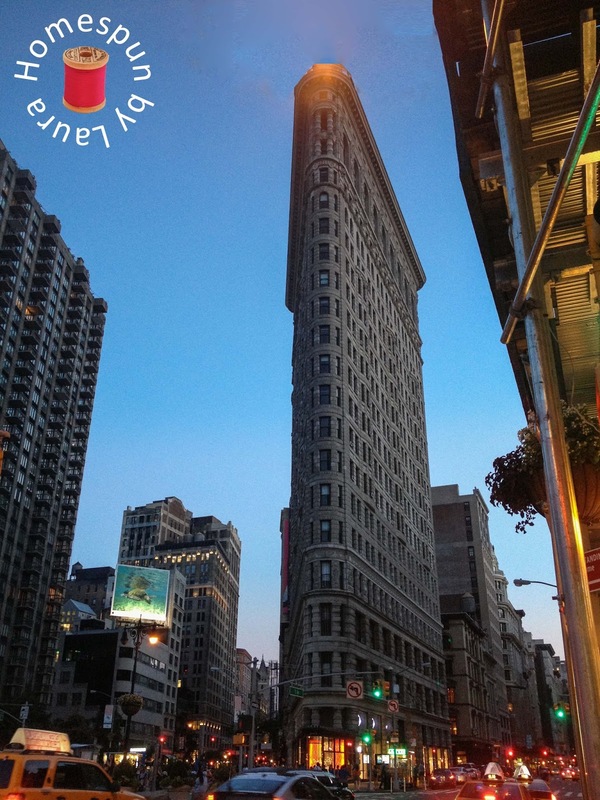 From our table in the park, we could see both the Flatiron Building and the Empire State Building while we ate. One bad thing about eating dinner outside at a park is that there are no restrooms available, at least that we could find. Fortunately, the Home Depot was only a few blocks away, so we went in for a look around (I actually noticed when I was making the plans months ago that it would be nearby and really wanted to go inside!) and to visit their restroom. 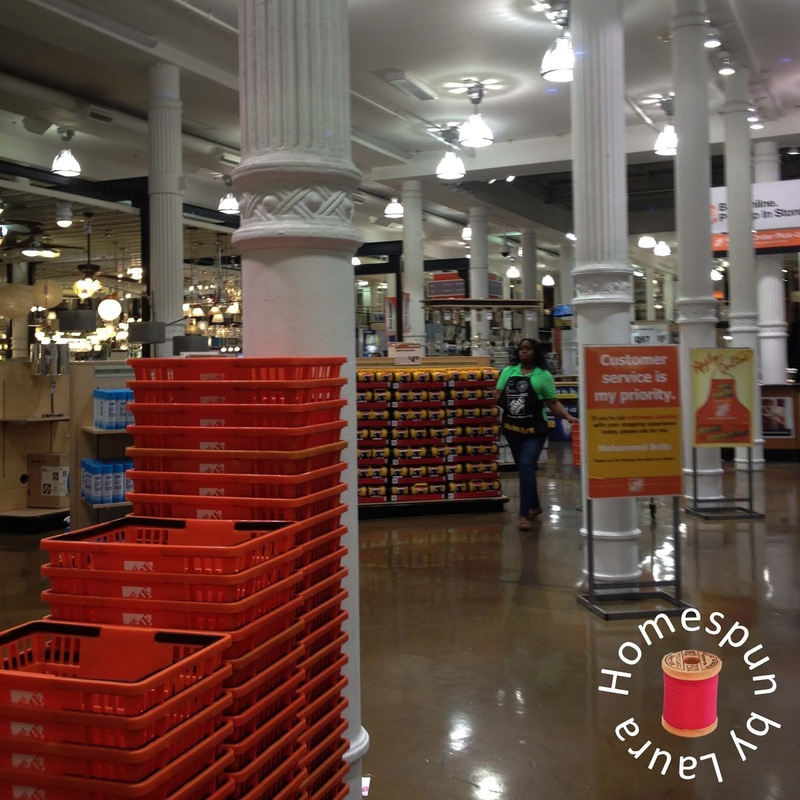 To me, it was kind of fascinating to see a Home Depot in the middle of New York City. Of course people who live and work there need a place to buy fixtures, paint, and plants, but a Home Depot in the middle of the city just seems strange and exciting to me! It was a beautiful old building with what I assume are original columns (or else they made quite an effort to make them look original!) and a cool skylight over the tiny little garden section and a view through it to the floors above. How cool would it be if you could look out your apartment window down into the garden section of Home Depot?! After my DIY nerd moment had passed, we walked over to the High Line and walked almost the entire length of it. It was too dark to take a picture with my High Line painting, so we decided to get back to it another day. 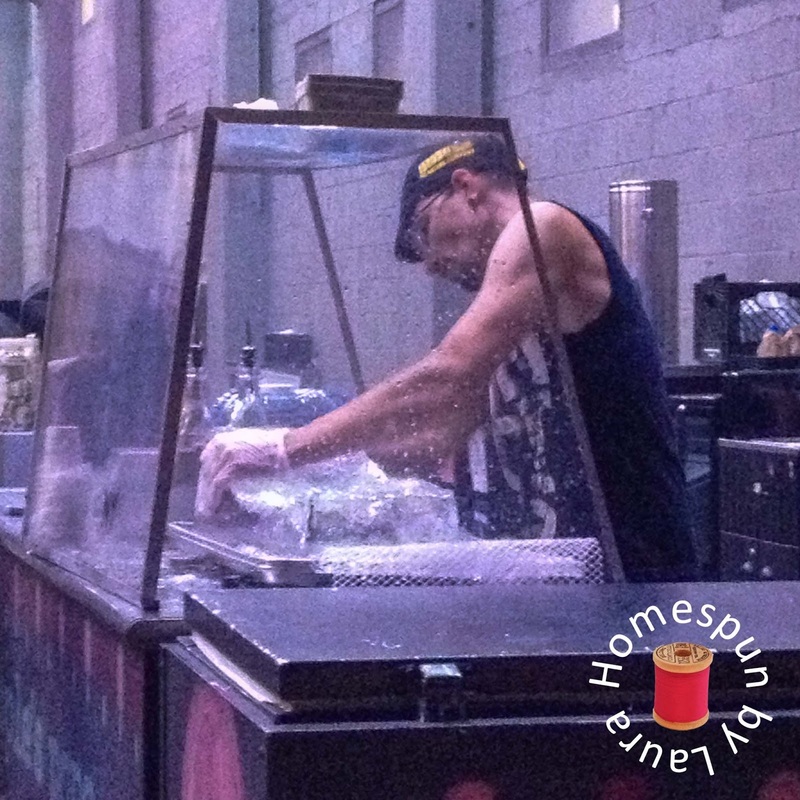 While we were walking, we passed an area with food carts, including one where a guy made ACTUAL shaved ice while customers watched. We stopped and stood for a while and got excited each time someone ordered shaved ice. What a great workout for the arms! 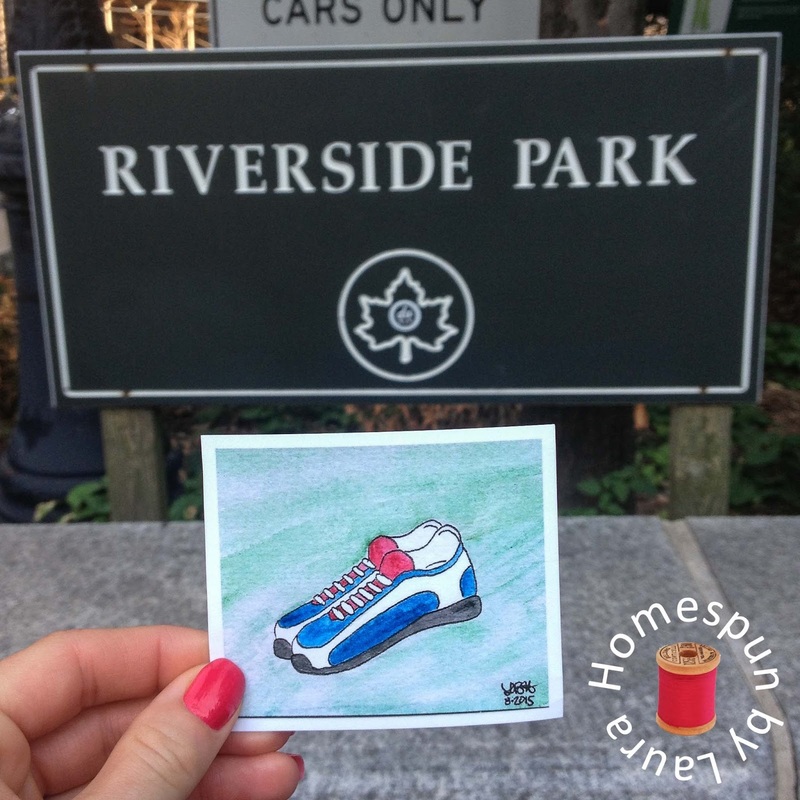 Sunday’s itinerary began with an easy run in Riverside Park (we didn’t want to tire ourselves out too much before a day full of walking). I typically get a little bored on long paths that really only allow for an out-and-back run, and I probably would here, too, if it were something I did every day or week. But for the one run, it was picturesque and enjoyable – and flat (a nice break from most runs at home)! It was definitely the most crowded path I’ve ever run on, but it was fun to people watch and looking at the boats on the river and all the tall buildings. 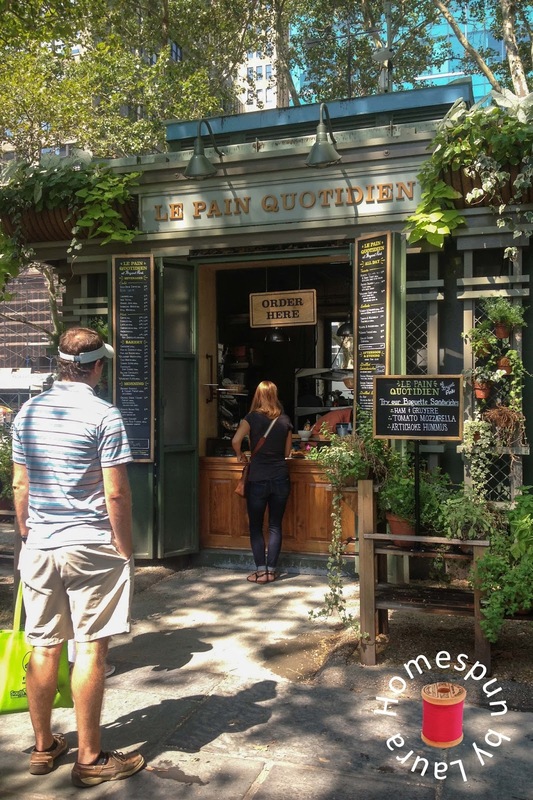 Our breakfast at the hotel didn’t quite fill us up, so we stopped and got a chocolate croissant in Bryant Park. Next was the event that had inspired the entire trip (and clue #3 from the scrapbook). 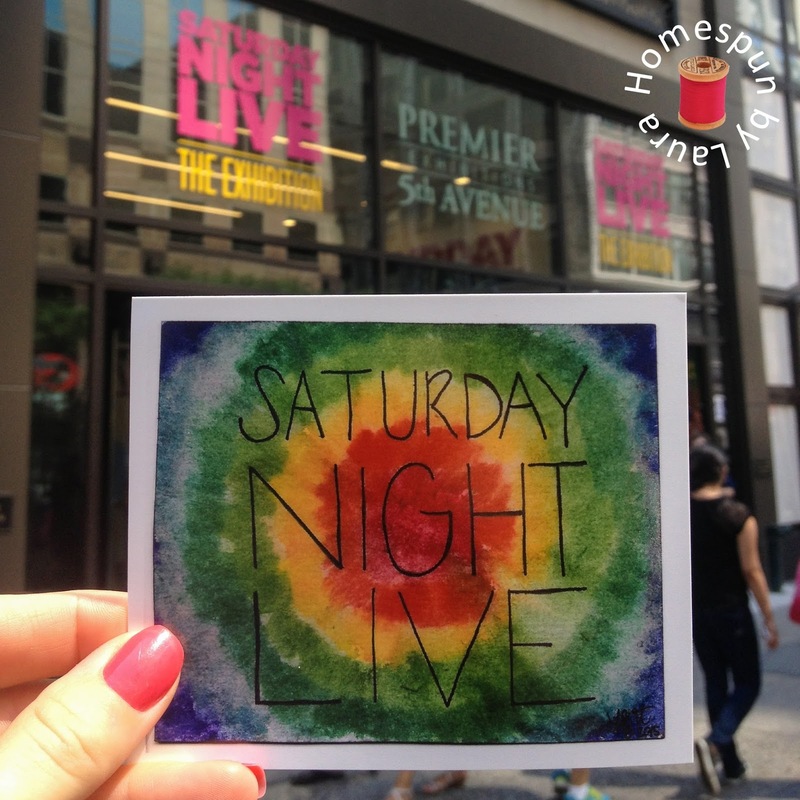 I had seen a segment on the Today show in late May about the opening of an exhibit for the 40th anniversary of Saturday Night Live featuring costumes, sets, and more from the show’s history. We’ve watched the show off and on since we got married and the Mister loved watching it when he was younger, and he loves museums, so it seemed like a great reason to travel to NYC for his birthday. It was really cool to learn about how the show came into existence and to walk through a week in the life of an SNL cast or staff member. The part that was the most interesting to me was learning about how the sets are produced (in a former shipyard in Brooklyn) and transported up to the studio in Rockefeller Center. The Mister thoroughly enjoyed his time there, too. Success again! 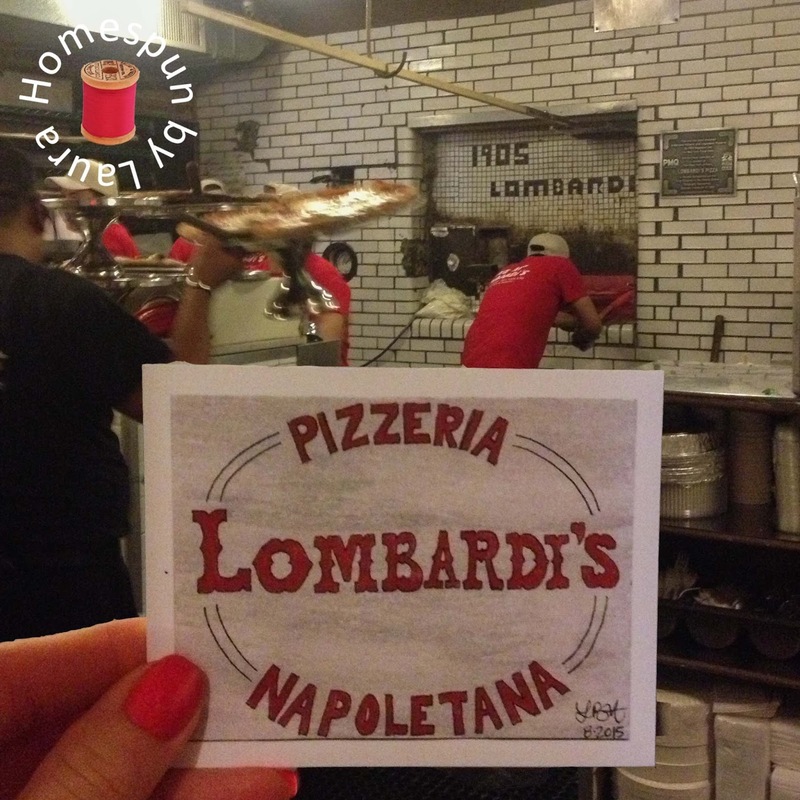 Next up was lunch at Lombardi’s, known as ‘America’s First Pizzeria.’ It’s a cool restaurant with an open kitchen that you pass through as you follow the maze that must have formed as the restaurant has spilled over into adjoining buildings over time. After lunch, we proceeded downtown to the Manhattan side of the Brooklyn Bridge and stopped to watch a bunch of guys doing a street show for a few minutes before making our way onto the bridge. It was very crowded and very long, but also very picturesque. We were glad to have brought two full 1-liter bottles of water with us since it was a warm afternoon. 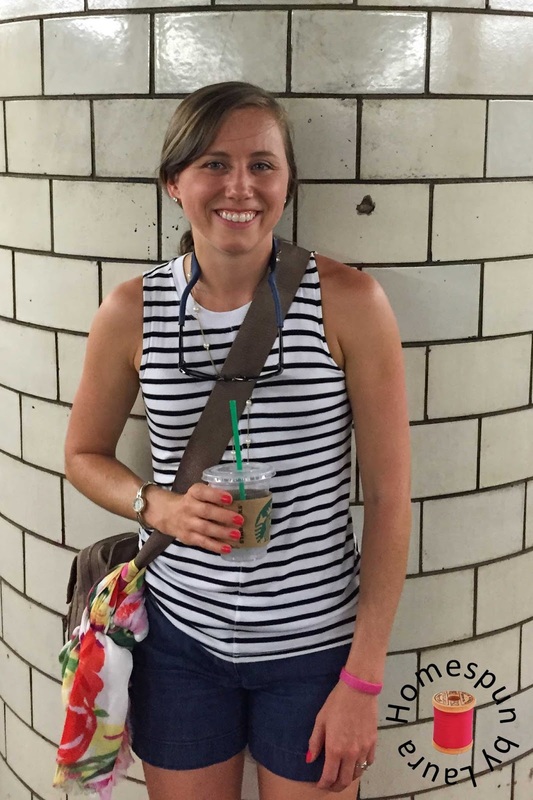 I’d love to have subway tile in our kitchen and master bath, so of course I couldn’t resist taking a photo with real subway tile in one of the stations in Brooklyn. 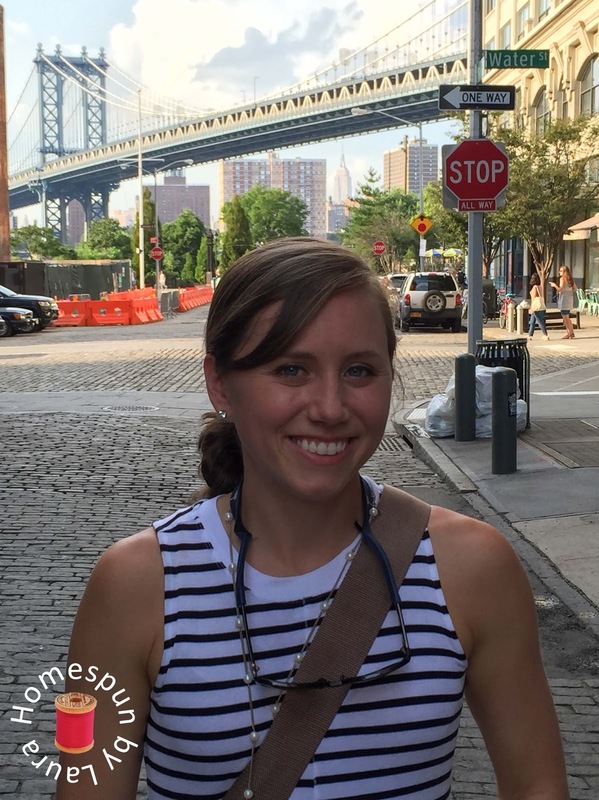 We enjoyed the small amount of time we spent in Brooklyn and would enjoy going back sometime for a longer visit (I really want to go to the Brooklyn Flea one day!). This picture near the waterfront is one of my favorites from the trip. I love the cobbled street and view of the bridge, and if you look closely right above my head, you can see the Empire State Building in the distance! We ventured away from the more touristy area near the bridge to watch the sun go down from the rooftop bar at Northern Territory in Greenpoint. We parked ourselves at a table with a view and enjoyed a couple of drinks as the sun dropped lower in the sky, eventually disappearing behind the skyline of Manhattan before going downstairs to their dining room for a late dinner. This was a really cool bar, and we met several friendly people while we were there; three of them were from Australia (this is an Australian restaurant owned by Australians), and one was an Englishman. The burger I ate there didn’t make it anywhere near my Top 5, but the fries were delicious, and the Mister enjoyed his Calamari and Lamb Lollies. If you’re ever in Brooklyn, make plans to catch the sunset at Northern Territory. 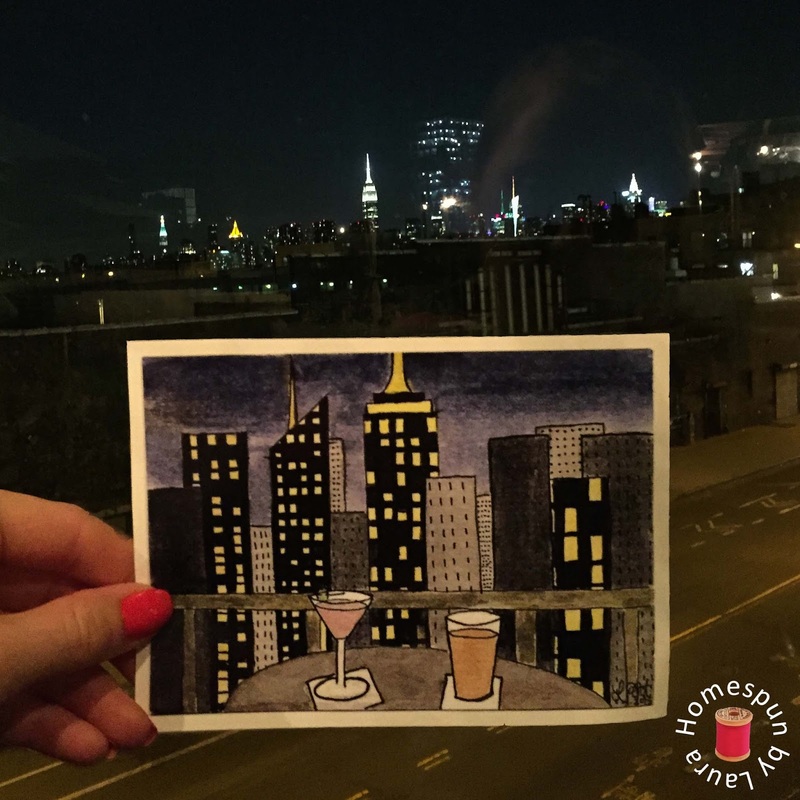 My original plan had been to go to a rooftop bar in Manhattan on Saturday night, but we didn’t quite get to one after our late arrival, so my Drinks with the NYC Skyline painting got its chance for a photo on Sunday in Brooklyn. There was a plexiglass barrier around the bar, and you can actually see reflections of some Brooklyn buildings in it (the big one to the right of the Empire State Building is the most noticeable). It was a late night on Sunday, so we slept in a little on Monday, then headed down to Central Park South to pick up our bikes. I bought a Groupon for a bike rental for two, and it was one of my favorite activities. We explored the park the full four hours (I packed our padded cycling shorts, which were a great comfort during that time!) and we covered a lot of ground. 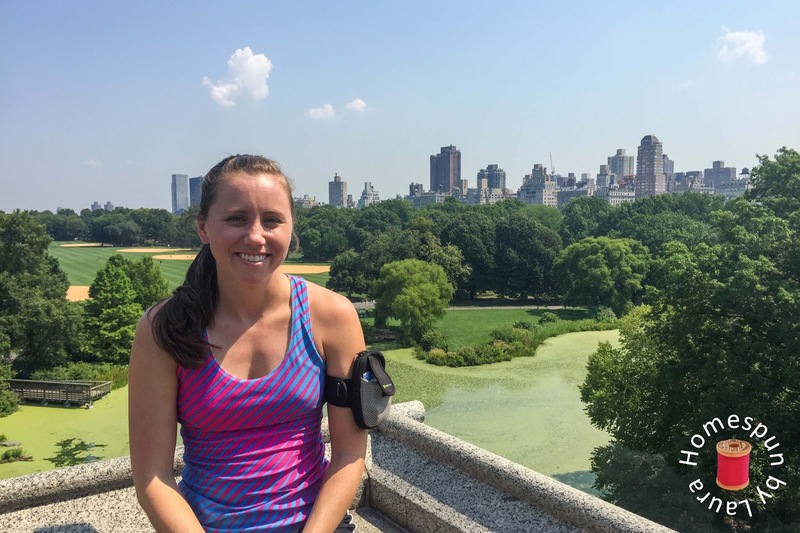 We made it around the entire perimeter and made detours to the center of it to see a few attractions, like the Boathouse, Bow Bridge, and Belvedere Castle. 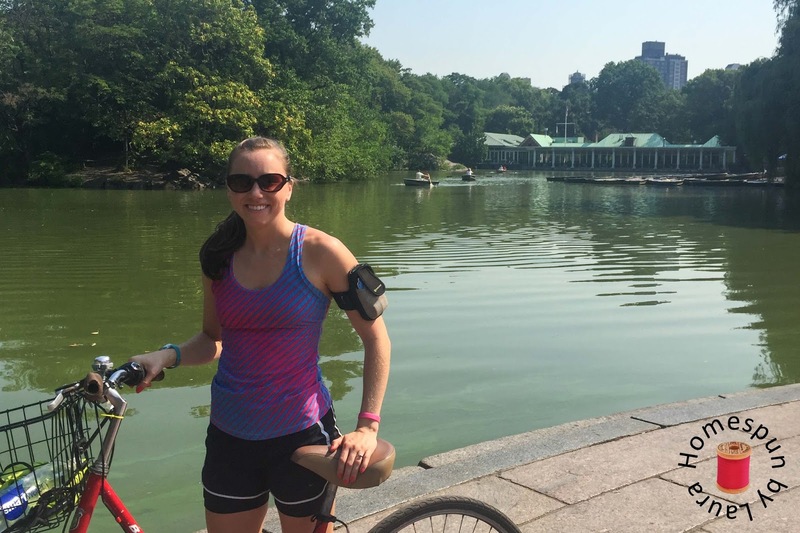 One thing I can say about our ride through the park is – I will never again make the mistake of thinking that Central Park is flat! There’s one area on the northwest side that has a major downhill on East Dr (near the pool that’s used as an ice rink in the winter!) and an even more major uphill a few minutes later after the path has become West Dr. It took every ounce of determination and focus I had to make it up that hill without getting off to push the bike. I think I might even have been able to run it faster than I biked it. It was no joke. like this one near the Belvedere Castle. Our picnic lunch turned out to be a little different than I had planned. Instead of buying fresh food from a market near Central Park and bringing it over in our bike baskets, we just picked up hot dogs (they weren’t very good) and ice cream (my ice cream sandwich had melted and refrozen at some point) from a vendor (who charged us more than the menu said our meal would be) next to the Bow Bridge. 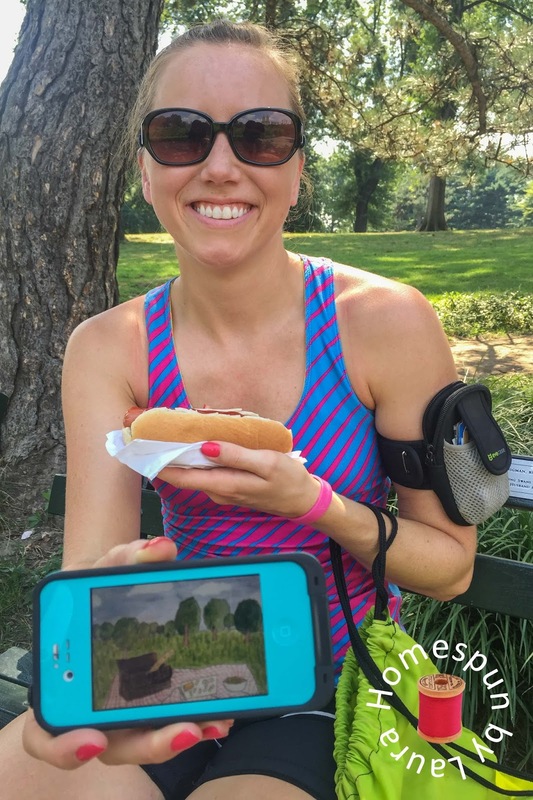 I didn’t want to fold the print of the Picnic in the Park painting to make it fit in my armband, so I took a picture of it and used the digital version as a substitute. At least the scenery was pretty. The plants near the bridge were a little overgrown, so it’s hard to see here. 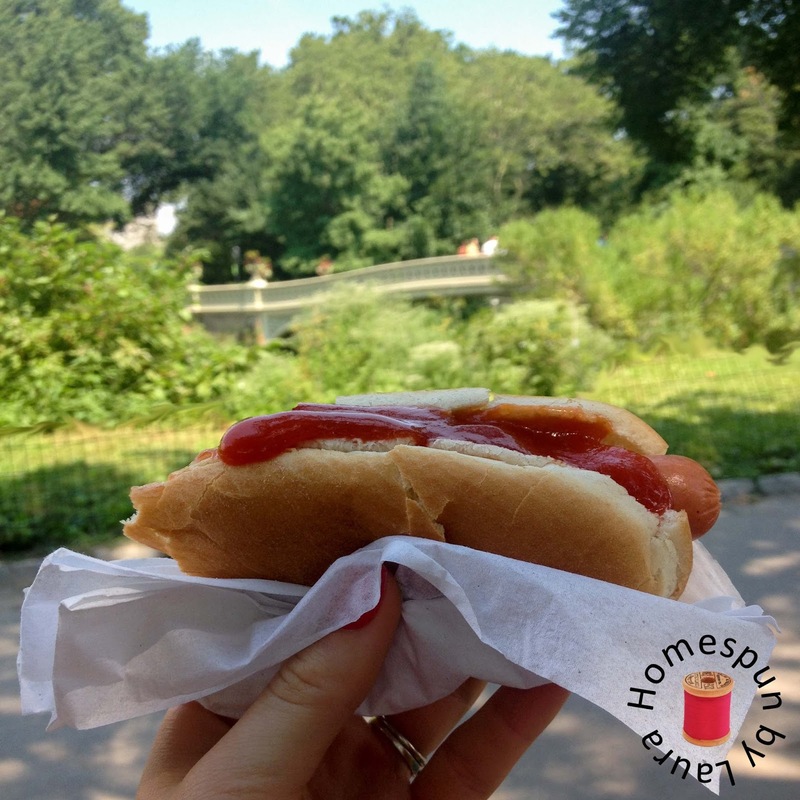 This was the longest either one of us had ever spent in Central Park, and we really enjoyed it. It’s such an interesting feeling to be completely surrounded by trees and nature when you can see the city buildings in the distance. We headed to our hotel with just enough time to lock the bikes up on the sidewalk, get cleaned up, ride them back to their drop-off location, and head down to 30 Rock for our next activity. Attending the Tonight Show Monologue Rehearsal was a cool and unique experience. I originally planned to get tickets to see an actual taping, but despite getting in the online queue on the release date for the August shows in late June, right at 11:00, the moment the tickets would be released, I couldn’t even get in to select a date before ALL THE AUGUST TICKETS were ‘sold out’ (it’s a free event, so they’re not really SOLD…but there were no more available) after ONLY 12 MINUTES! Seriously, the entire month – not even just the one date we could attend – was filled within twelve minutes. So a few weeks later when the Monologue Rehearsal tickets were released, I tried again…and was waitlisted. Then about two weeks before the trip, I got an email that said we’d gotten tickets to the Rehearsal! We could have gotten in line for standby tickets the morning of the show but chose to just stick with the tickets for the Monologue Rehearsal and take full advantage of our bike rental. Before checking in for the monologue rehearsal, we looked around in the bottom two levels of 30 Rock for a few minutes, then headed to the first of three different holding areas before getting into the studio. We then waited for a few more minutes before the Rehearsal started. Then Jimmy (Fallon, that is) came out on stage and introduced himself, explained the process and purpose of the rehearsal, which is to test jokes out on a small audience to see which ones are keepers and which ones fall flat. The writers sit in and make furious notes, and then Jimmy disappears through a mysterious hidden door right behind the podium where his sidekick Higgins stands during the show. Neither one of us has actually ever seen the show since he took over (we’re just not up that late), but we enjoyed the event. Before we left for NYC, I set that night’s show to record so we could watch it when we got home to see what made it and what didn’t. My favorite one can be seen here. 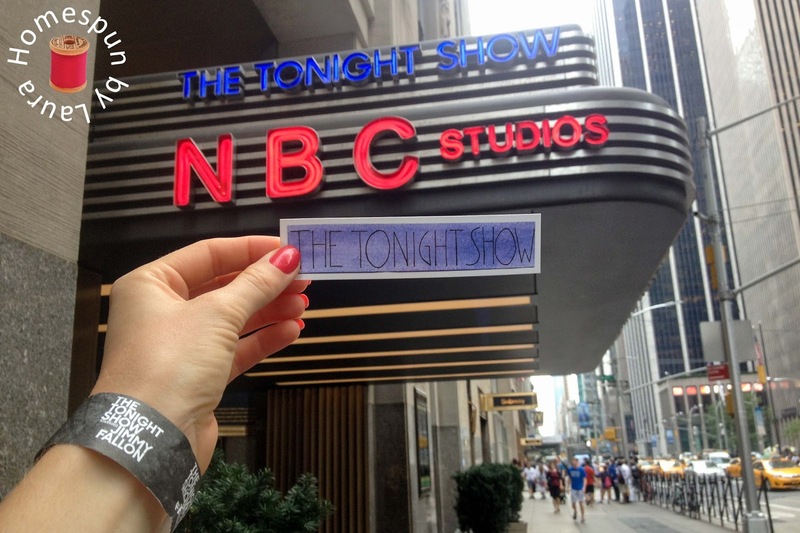 so this had to do for the Tonight Show picture. 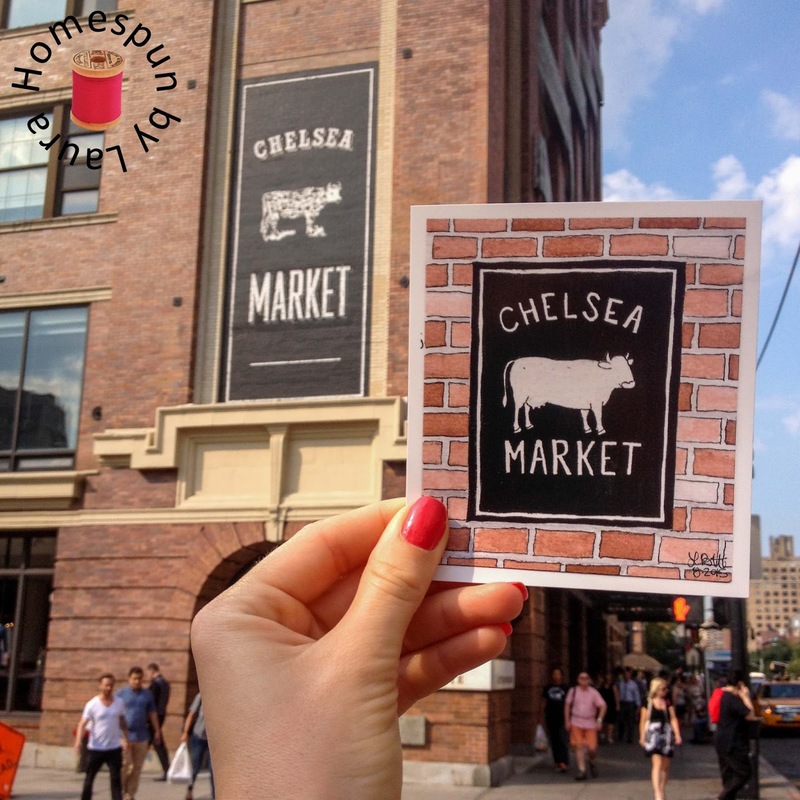 We headed to the Meatpacking District next to go to Chelsea Market, a really cool indoor specialty shopping center full of restaurants, a variety of shops, and a grocery market. The building was originally the Nabisco factory and is a place I would enjoy buying my produce if I lived nearby. I wore a shirt I refashioned a few years ago on Monday. 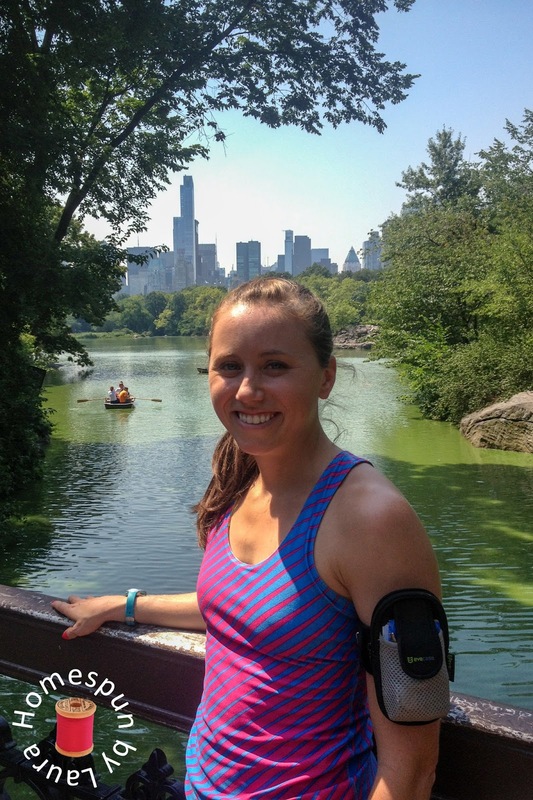 Sleeves were not necessary in most places during our trip due to the warm weather. I would have loved to buy some of the flowers from this stand. 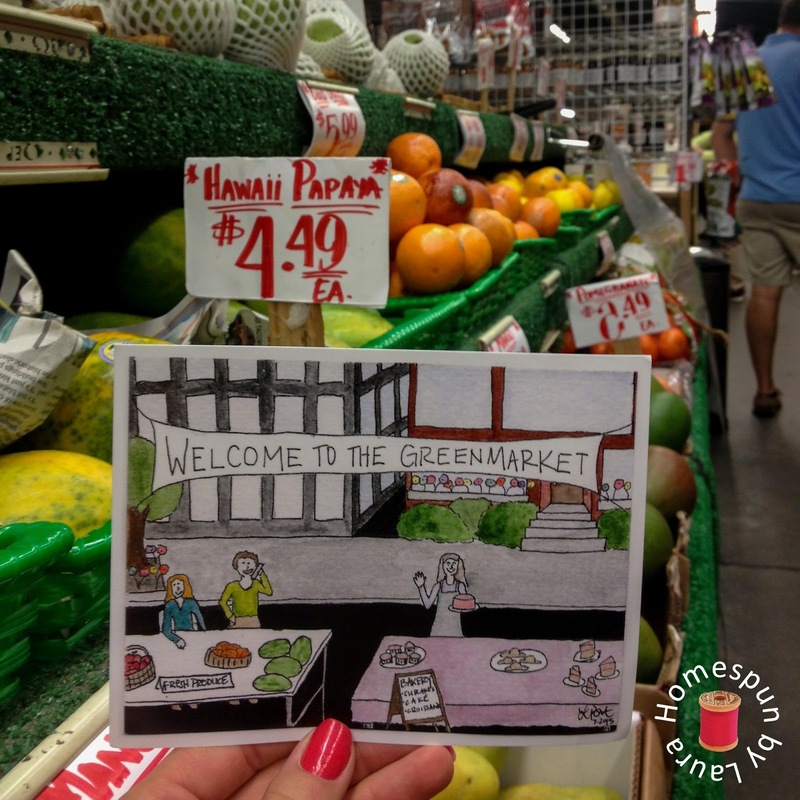 so the grocery in Chelsea Market substituted as the background scenery for its painting. 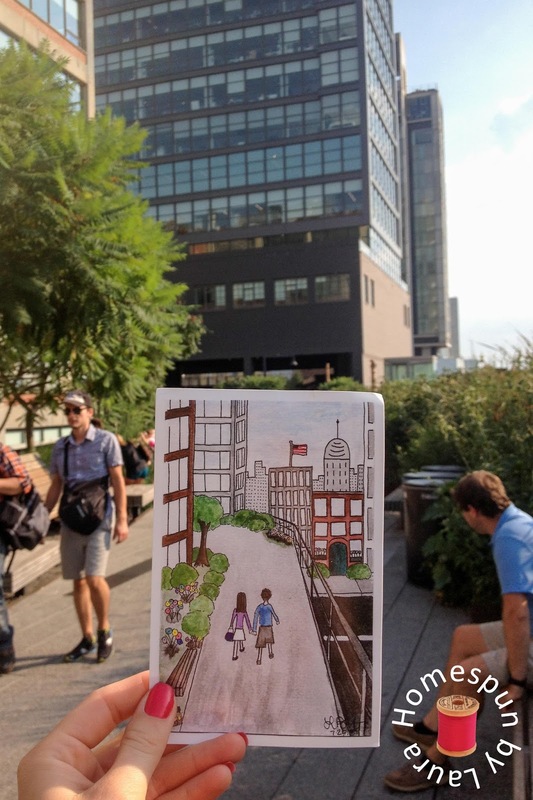 The High Line was only a few blocks away, so we walked back to it and found the approximate location that I had painted. 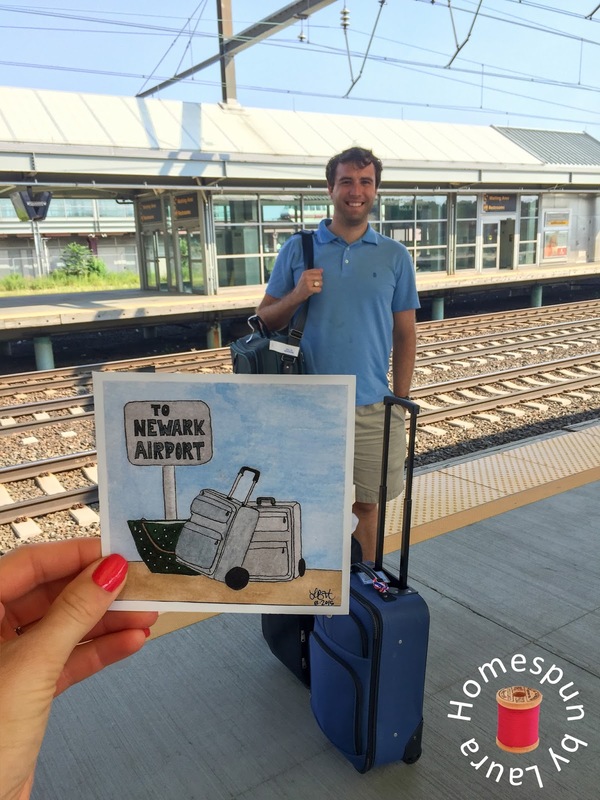 The really funny part that I could never have planned was that the Mister wore the exact clothes that day that I had drawn him in – a light blue shirt and khaki shorts. I, on the other hand, don’t even own a purple shirt and didn’t take my white shorts to NYC (that just seemed like a disaster waiting to happen). 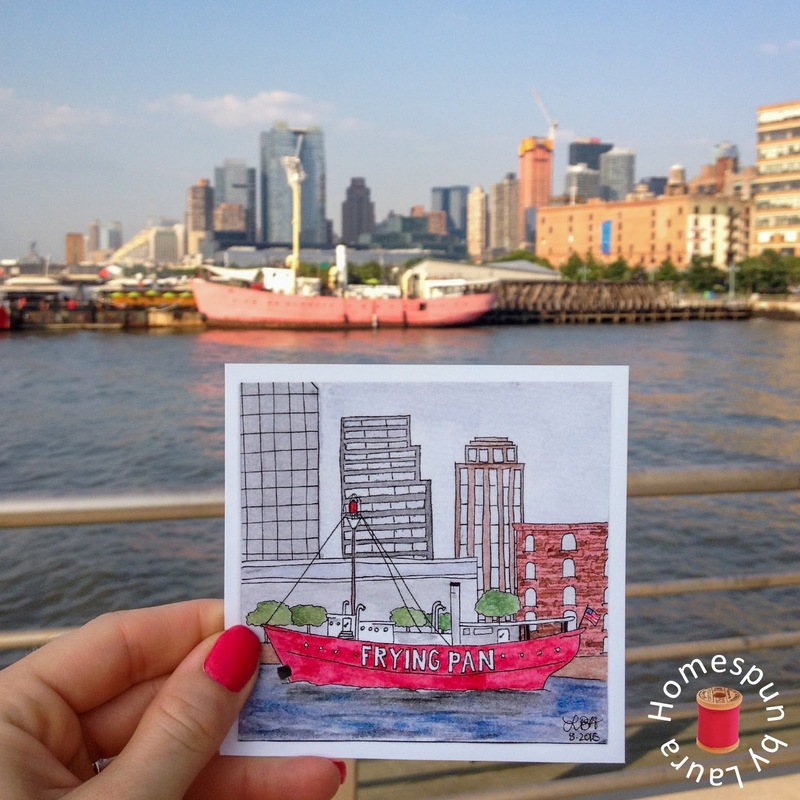 We exited the High Line next and walked a few blocks uptown toward dinner at Pier 66, passing through Chelsea Piers on the way. We passed by the Golf Club, peeked through the window of an enormous room where an evening gymnastics class was going on, saw a giant yacht that was docked nearby, and stopped to read a plaque about George McClellan, who was mayor of NYC in the early 1900s and oversaw the construction and opening of many NYC landmarks, including Chelsea Piers. Our next stop was dinner at Pier 66 Maritime, which is basically a barge docked at the pier, with two historic boats docked at the barge. 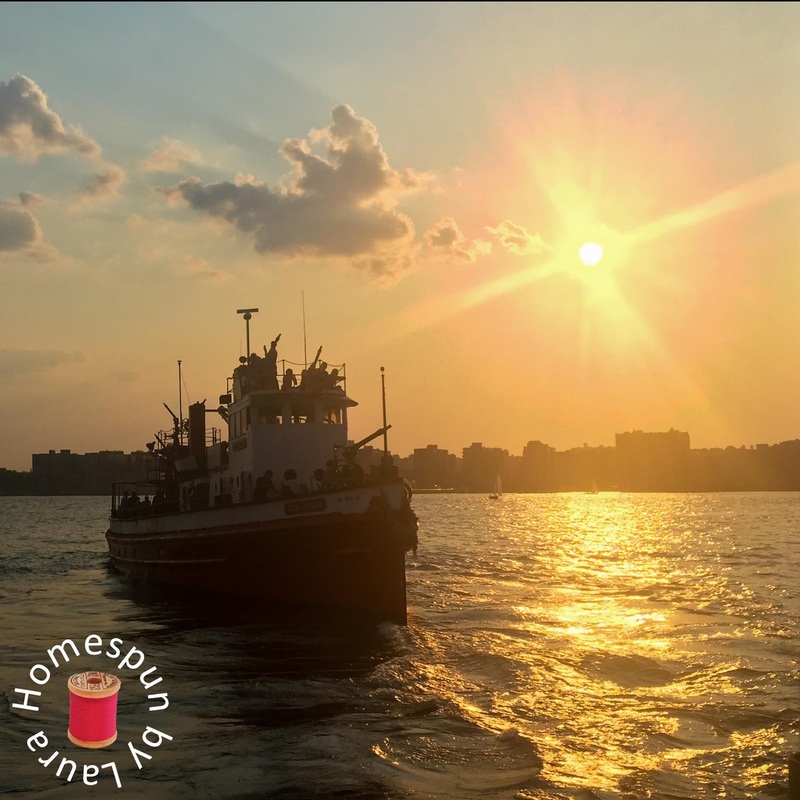 One of them, the John J. Harvey Fireboat, had been rented out for a sunset cruise that evening, and we watched the crew prepare the ship for departure from our table on the barge. After dinner, our last planned stop was to head back downtown to Pier 25 for a game of mini golf. 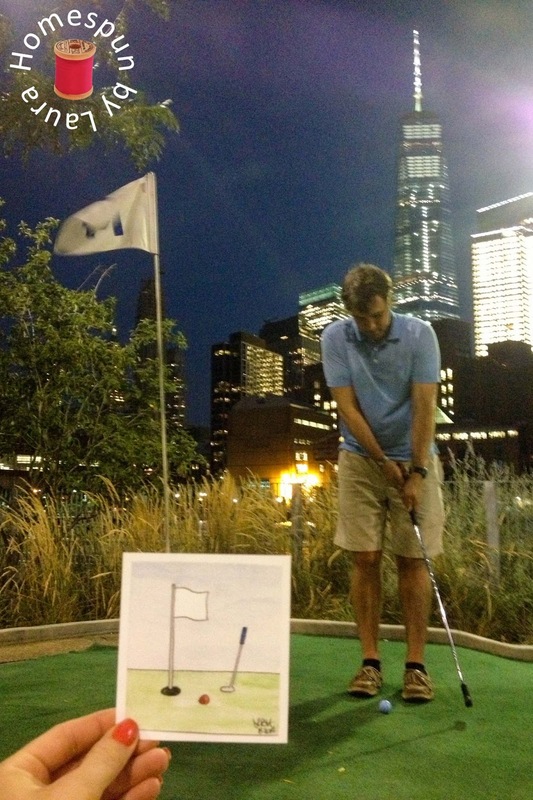 I was shocked at how reasonable the bill was for the two of us to play a game of mini golf on a pier in New York City – way less than it costs to play in one of the many options available closer to home in Myrtle Beach, and definitely way cooler. 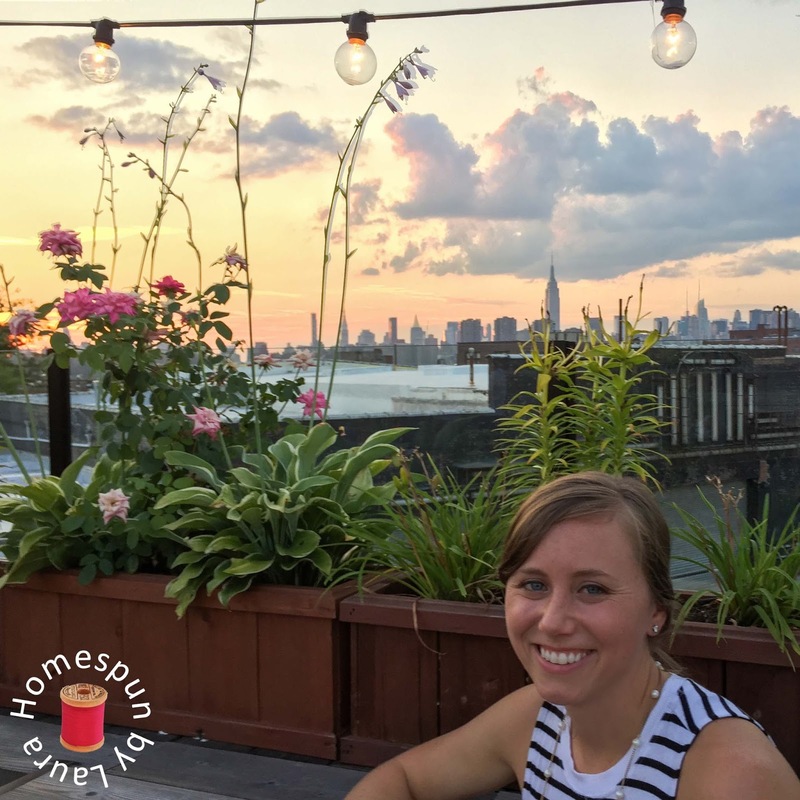 We could see the Hudson River, sand volleyball courts with games going on, and of course, the lights of the NYC skyline, dominated by the new World Trade Center building. Since we were there in the evening, it was mostly couples playing around us, and we moved along pretty steadily. We both shot one hole-in-one, and even though my short game is actually pretty good, the Mister beat me by one stroke. Our last stop on Monday night was, regrettably, Times Square. It was about 10:15 when we arrived, and we were gone by about 11:00. Aside from our travel problems on Saturday, it was probably the worst 45 minutes of our trip. 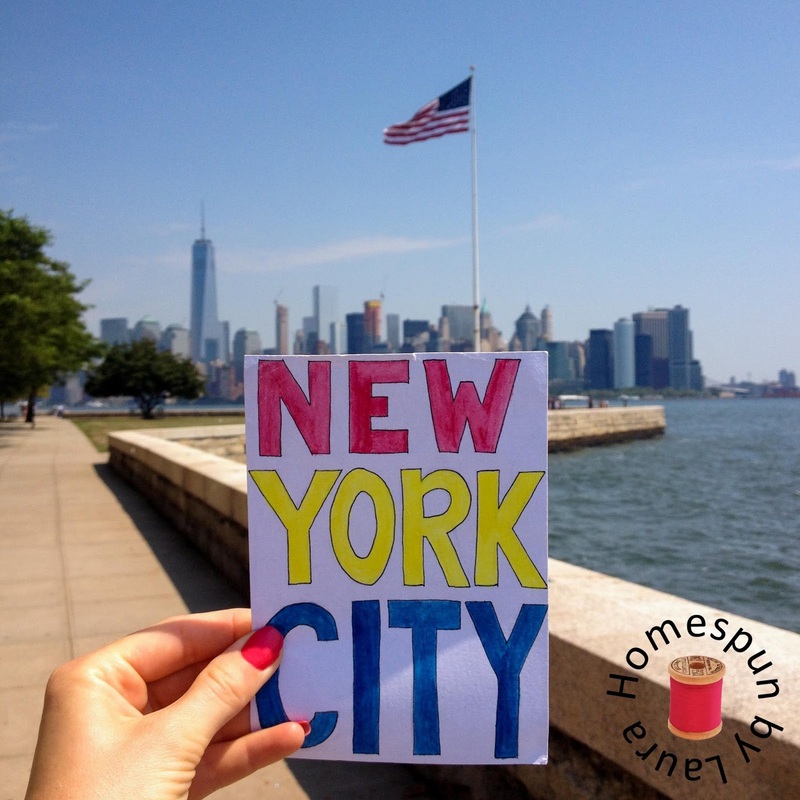 It felt like all 8.4 million inhabitants of New York City were there. We stepped into Toys ‘R’ Us for about 15 minutes, and it was a madhouse. Next, we walked over to the Hershey’s store, where we were both handed a free Kiss when we walked in. We pushed our way through it for about 5 minutes, then did the same at the M&Ms store (no free M&Ms, though, so not worth it! ), before heading back to the subway station. Never at any other time during the four days did we find another location to be so crowded. I was relieved to get back to our quiet street in the Upper West Side. Tuesday morning started early so we could pack up, eat a quick breakfast, and check out of our hotel by 7:15. We left our bags with the front desk to pick up later that afternoon on the way to the airport. 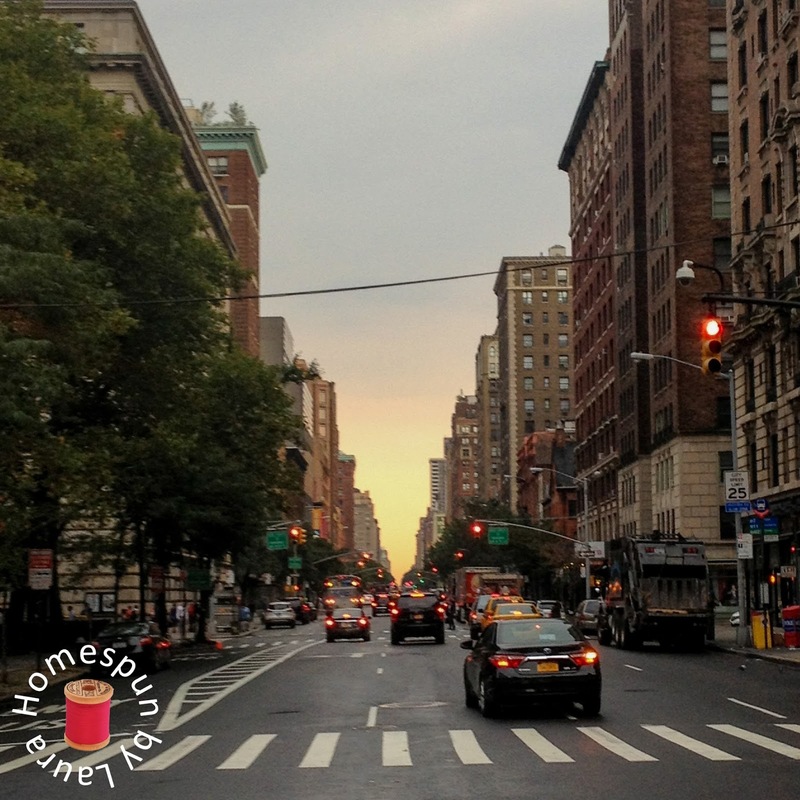 In the hotel breakfast area, I made myself a Belgian waffle, grabbed a yogurt and some butter, and ate it as we walked toward the subway, finishing just in time to snap this picture of early morning traffic on Amsterdam Ave. at W 72nd St. as we arrived at the Subway station. 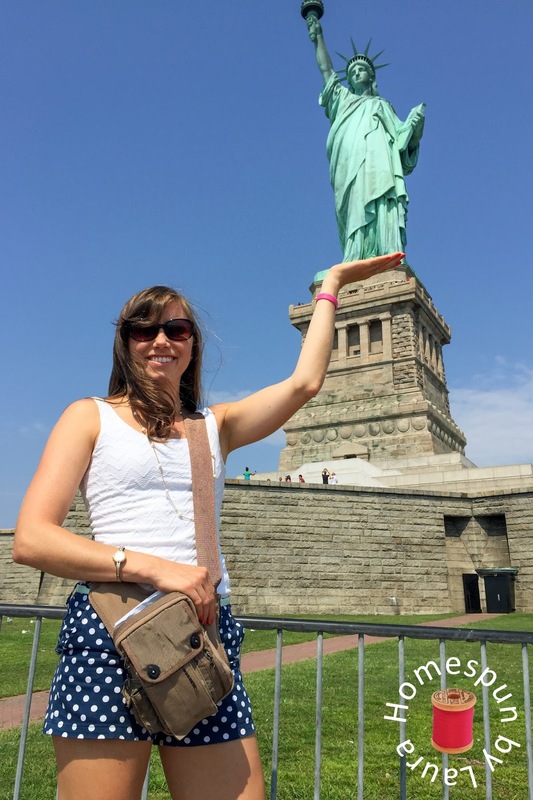 It was a long ride down to our stop near the Statue of Liberty Ferry Terminal, a short walk to pick up our tickets at Will Call, then an even shorter walk to get in line to go through the security check before finally getting on the first ferry of the day. From the boat, we had great views of the city, the bridges, and the harbor, and of course, of the statue itself. I really love this view of the Statue and the city. 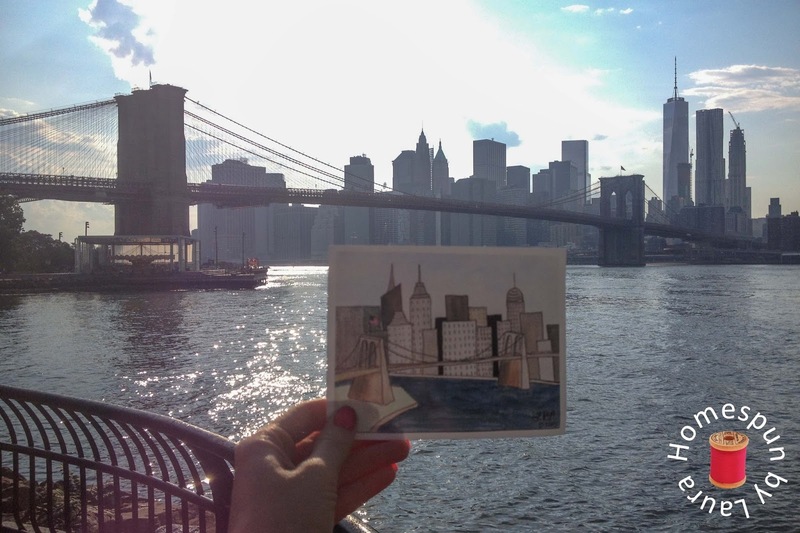 I took one of my final painting photos as we approached Liberty Island. We stopped off at the Pedestal for a few photos and to take in the view before heading up to the Crown. 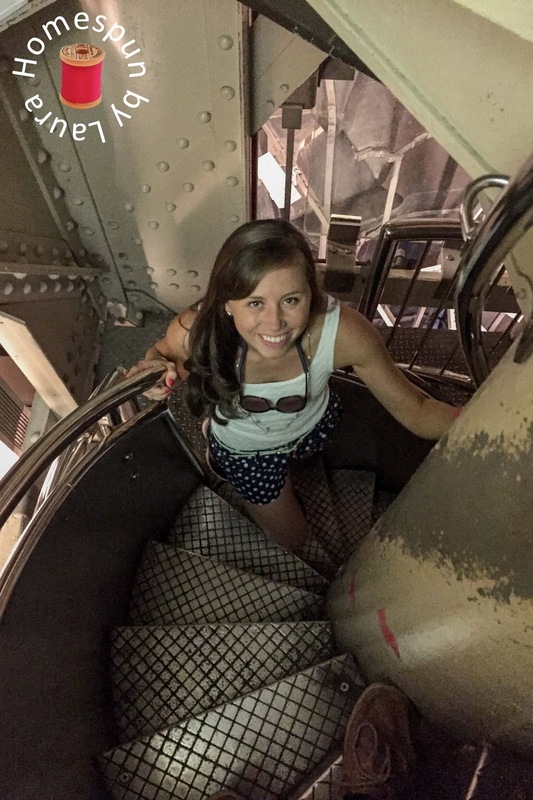 The only way to get up there is by climbing 162 steps up (and back down!) a narrow, winding staircase. Once you’ve reached the top, there are maybe 15 square feet to stand on before you head back down the opposite side of the double spiral staircase. 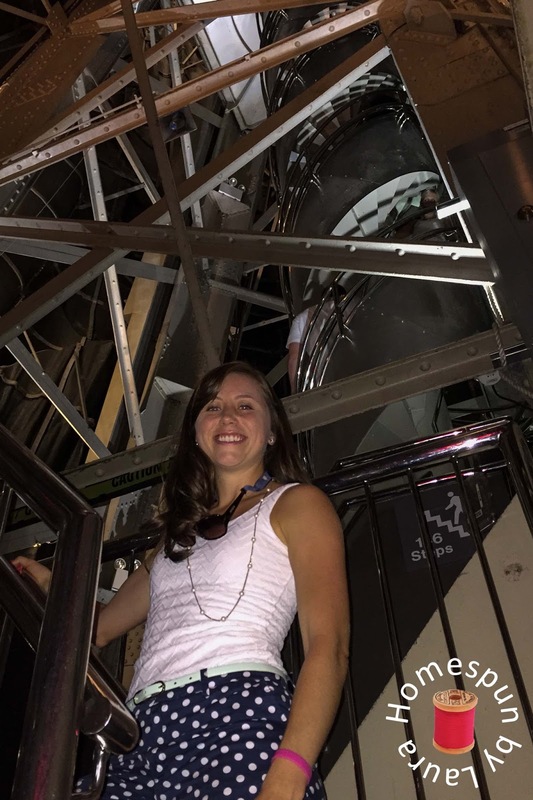 The Park Rangers stationed in the Crown actually only stand on narrow beams similar to the ones above my head in the photo below…and that’s after they climb up the staircase to reach their post! Fortunately, they switch off every couple of hours. The double spiral staircase (one side goes up and the other goes down) is behind me in this photo. The view from the top is amazing. Heading back down the steep staircase. The railings on each side were a great help! 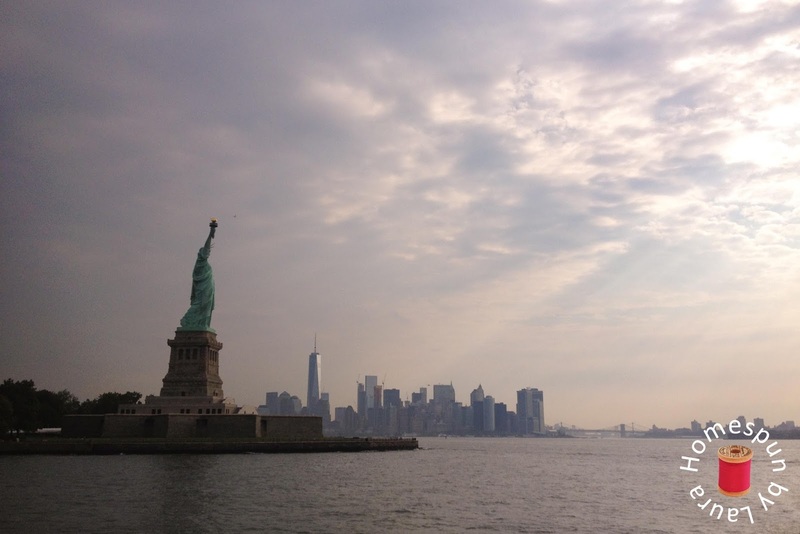 …and take a photo of the beautiful view from Liberty Island. 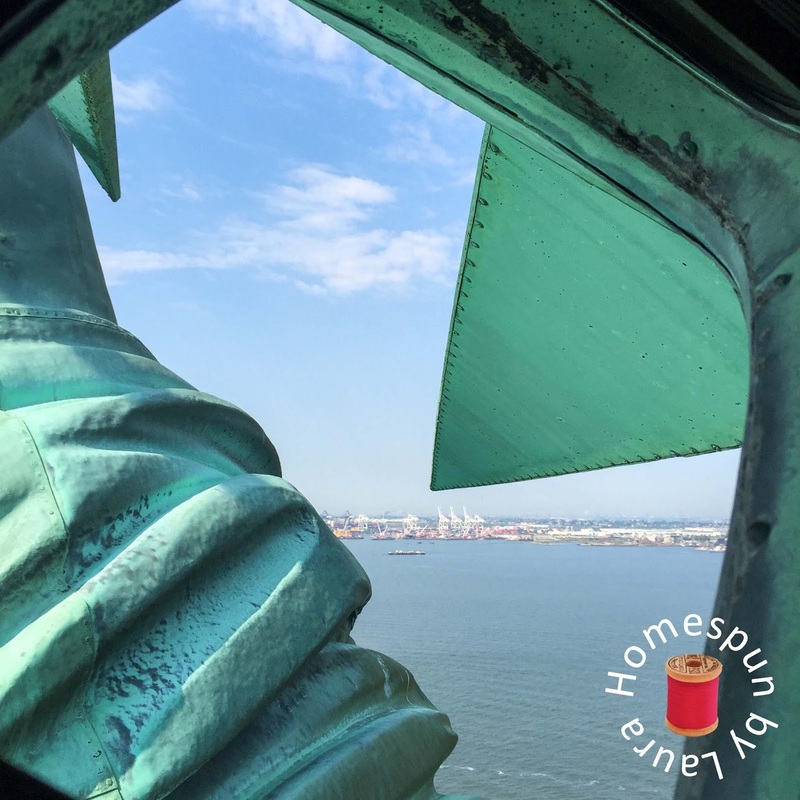 For many immigrants, a view similar to this was their first glimpse of the US of A. The ferry ride to Ellis Island was a short one, and since we the time remaining in our trip was limited, we decided to make our visit to the island a short one, too. We took the self-guided immigration history tour at the museum, which takes visitors through the process that immigrants went through from the time they disembarked to the time they were permitted to proceed to the mainland, were quarantined for various conditions, or were sent back to their native countries. The Great Hall inside the main building. 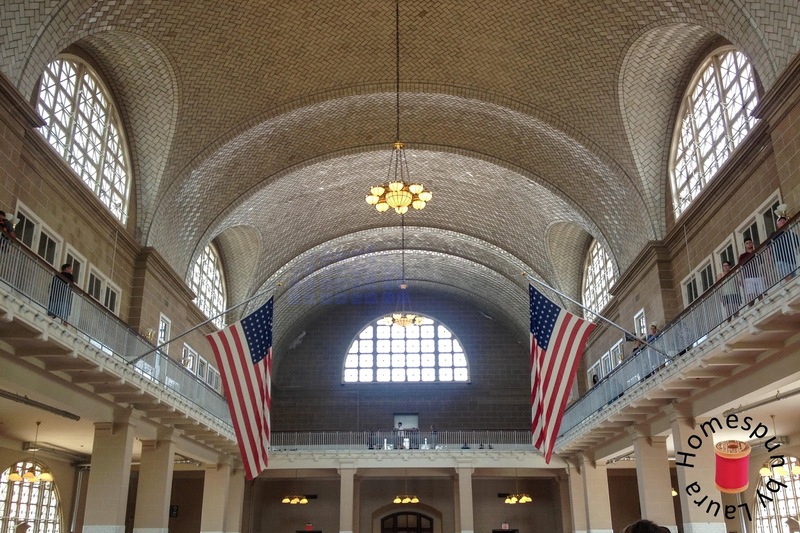 We finished up on Ellis Island in under an hour (you could spend a whole day there, so there was no way we’d be able to see everything in the time we had!) and moved toward the terminal for our cruise back to Manhattan. Lunch was at Potbelly on Broad St. in the Financial District. 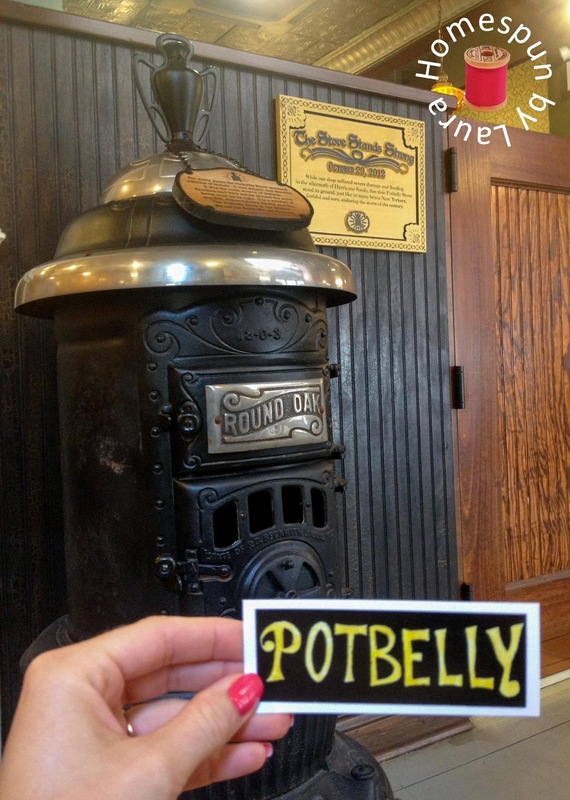 We discovered Potbelly two years ago on a trip to DC and loved it. There aren’t any in South Carolina (or anywhere in the South that I’m aware of), though, so we enjoy visiting them elsewhere when we can. We finished off our lunches with Oreo milkshakes to go, and I bought two Chocolate Brownie Cookies, which came back to SC with us. After dinner at home that night, we shared a delicious cookie sandwich, which I made with a few spoonfuls of leftover homemade buttercream icing from a cake I’d made the previous week. results from eating too many delicious sandwiches, cookies, and milkshakes. After lunch, we walked up Wall Street past Tiffany’s, the Stock Exchange, and Federal Hall (where George Washington was inaugurated in 1789) to Trinity Church, where Alexander Hamilton is buried. It was then time to head back to our hotel to pick up our luggage and catch the train back to the airport. 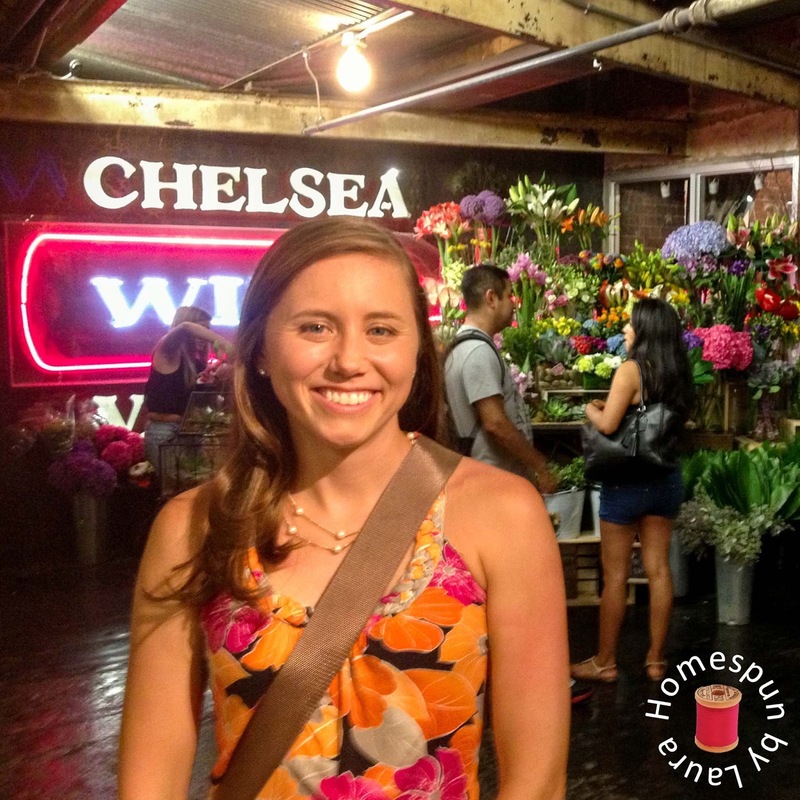 We thoroughly enjoyed our time in the city and found it easy to get from place to place. 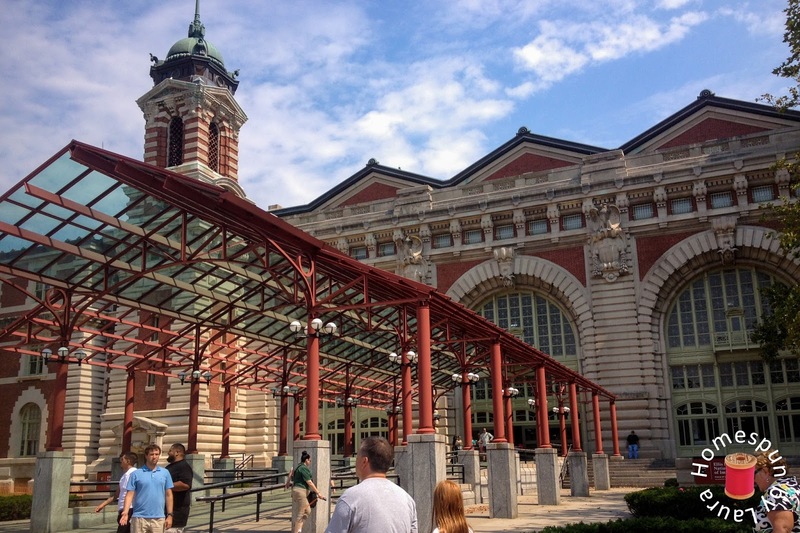 With the exception of delays on the train getting into the city, taking the train from Newark into Manhattan was a quick, easy, and cost-effective option. The Comfort Inn on West 71st Street was quite small but had everything we needed for a fair price (for the city, anyway), including a free breakfast each morning, and was close to two subway stops. 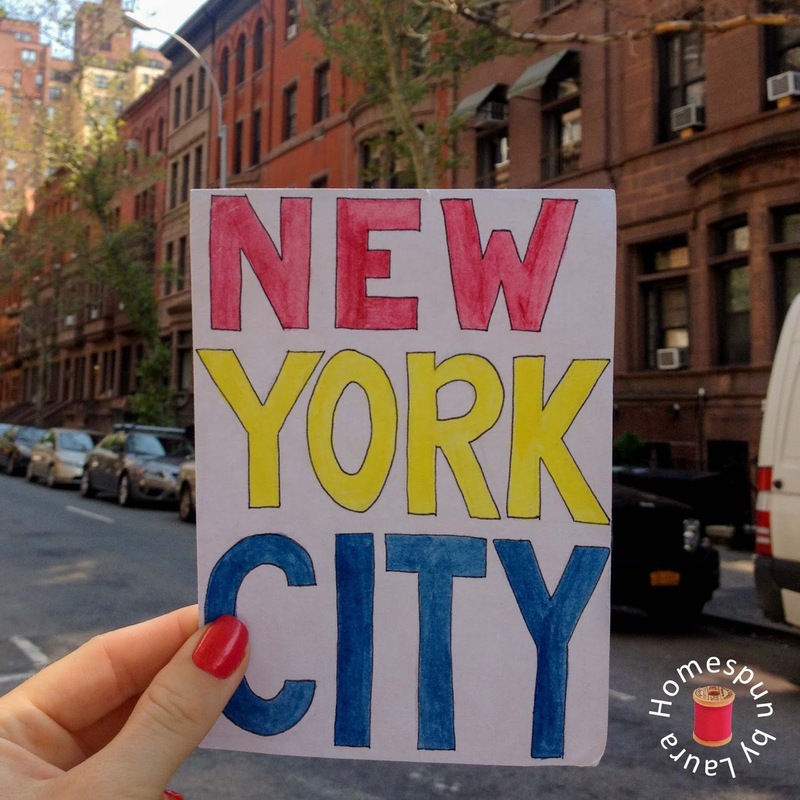 Traveling to another Borough was a good decision, and we hope to make it to the rest of them one day (and who knows, maybe a New York Marathon is in my future!). In short, taking in the city was a fantastic way to celebrate the Mister and his big b-day. I hope you enjoyed reading about our little trip and maybe got a few ideas for one of your own! Thank you for your pins, shares, tweets, and likes!